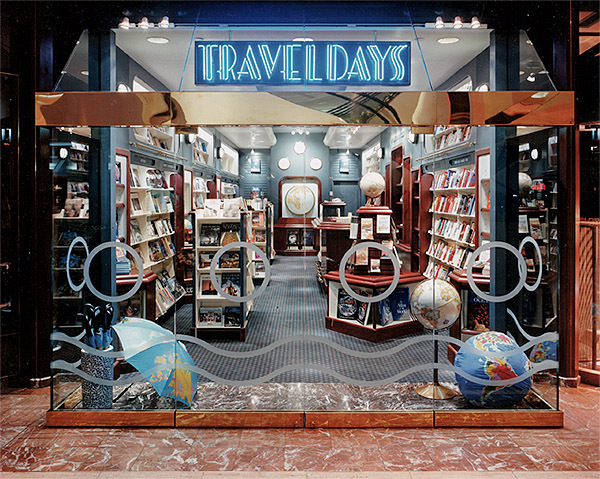 Traveldays is a specialty book shop which sells travel guides, maps and travel-related literature. It projects the image of a first class lounge on a 1930’s luxury liner, and makes the browser feel as if the trip has already begun. Waves and portholes sandblasted into the glass storefront, and waves in polished brass on the side of the counter, carry out the theme of ocean travel. The design of Traveldays also included bags, wrapping paper, and travel accessories.